As we've seen recently the mornings can give a false impression of what's coming for the rest of the day and today was no different. 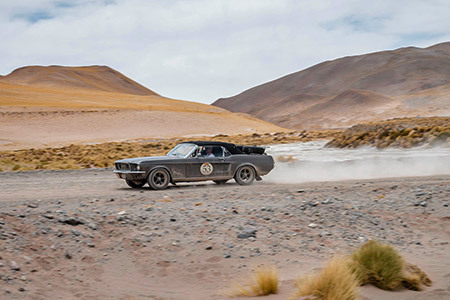 We started out under grey skies and heavy drizzle and the first regularity through El Disconicidos, a mining area alongside an alluvial stream, was blanketed in thick fog. The route climbed along the wide flat valley, through another forest of cacti clinging precariously to the sides of scree slopes past patches of grass and small stands of cypress trees. The road was hard for the cars too. Dominique Vanity and Daniel Spadini’s 1966 Citroen DS21 lost an exhaust and then several fuel pumps early on in the day. Andy Inskip and Tony Jones, sweeps extraordinaire, were never far away though and, as usual made sure that they arrived safely at the night halt. 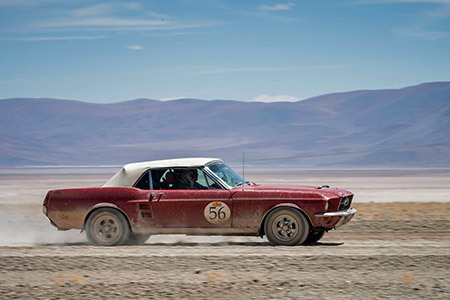 Erik van Droogenbroek now travelling with his wife in the red Ford Mustang kept losing power in the thin air despite the best efforts of Jamie Turner and Bob Harrod. Ronald Vetters and Ann Puts, towing heroes of yesterday, unbelievably suffered two punctures on their rental 4x4. As usual though an ERA truck was quickly on hand to help replace one tyre and to plug the other one.